Purse shopping on a street corner in Times Square, NYC. 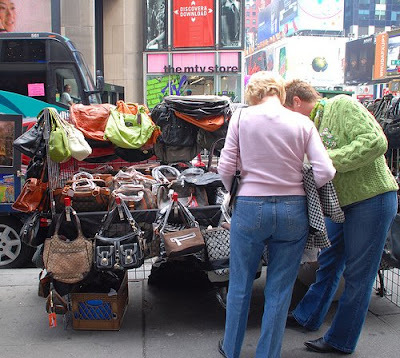 Some of the more covert purse sales in NYC, usually by an alley behind the actual designer shops. Sometimes they are sold out of car trunks. Overindulgent celebrities carrying around original, pricey designer handbags. About a decade ago, it used to be almost anyone who wanted a designer purse bought an original at a premium price, and knock offs were much harder to find. (Personally, I don’t believe in spending outrageous amounts of money on something I could accidentally leave on the subway, or hanging over my chair in a restaurant, or worse, get mugged and lose it.) Today, knockoffs are in abundance and available through home parties and on the internet and even sold surreptitiously on street corners in NYC. And now, without an untrained eye it’s almost impossible to tell the originals from the knockoffs. 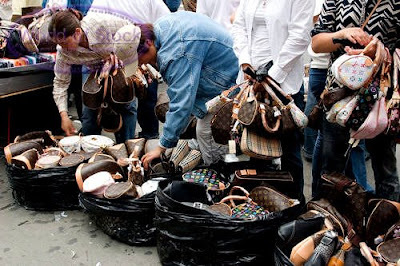 I see women all over with fake Coach, Prada, Chanel and other fascimilies of designer bags. When I see this is bothers me. I believe if the knockoffs are in such abundance, it makes paying ridiculously high prices for originals almost redundant. Why pay full price for an original, when a majority of people who see it will assume it’s a knock off? Nowadays, don’t the imitations cancel out the originals? 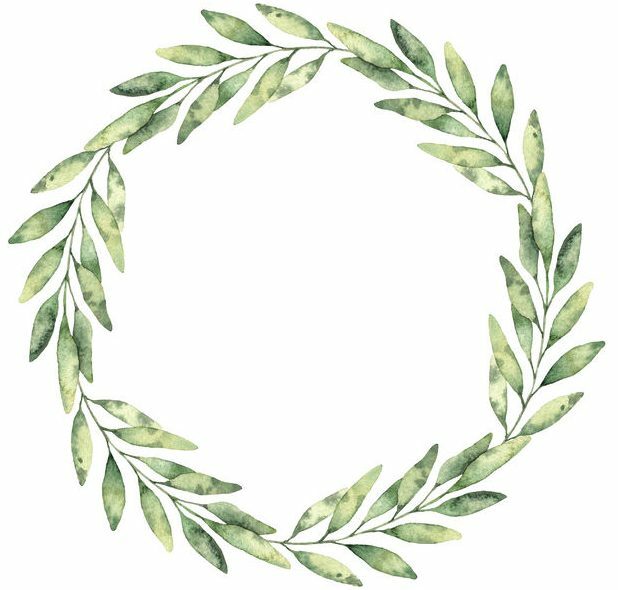 You can include me in this majority. I have no idea of what to look for to determine an original from a fake, and frankly I don’t really care. Why do people pay such a high price for designer bags anyway? This goes for designer shoes and sunglasses, too. What is the motivation? What message are people sending when they carry a handbag that costs as much as a brand new appliance? My husband is of the opinion when a woman carrys a designer purse, all it tells him is, “Look at me, I’m stupid-I paid waaaayy too much money for this purse.” I know the ‘stupid’ part is crude, but he might have a point. Is the message, “Look at me, I’ve got money?” or, are the bags themselves giving women an air of self-importence they don’t really have deep inside? Are these designer accessories masks for low self esteem? Good question, huh? It is interesting to think about. Now, I’m sure there are many self confident women out there carrying these bags around who wear them just because, but will we ever really know? I’ve never bought an expensive designer purse and I really don’t think I’d want one. But, I did find a ‘real’ Kate Spade bag at a flea market once for $4, and the strap was hot glued to the woolen plaid exterior and the magnetic snap was also pulled off. This tells me something. The Kate Spade was made no better than any other quality non-designer bag. How are these designer ones different from off brand leather purses? Is the quality really all that? I also wonder if the knockoff industry has actually hurt the sales of original designer handbags. I also believe these expensive purses enable people to fall into the realm of excess and materialism. I have a friend who claims she purchased her sister a $2K designer handbag for her birthday. That’s wonderful, but geesh, I could Pergo my dining room for that kind of dough. My main goal in this post was to bring up how nowadays I don’t feel knockoffs are doing what they were originally intended to do. Now, you look at a kockoff and say, geeze, that’s an imitation, instead of saying, wow, she’s got a Prada! When I see a woman with an original (not that I’d know the difference), I think she’s carrying a cheap imitiation. Does anyone agree with me here or am I all wet? Designer bag trivia…Did you know Kate Spade is married to Andy Spade who is David Spade’s brother. We all know David Spade is the famous actor. Sometimes we are thinking along the same lines at the VERY same time & it's spooky! LOL! Not an HOUR ago I was watching tv and a commercial for diamond studs at 'only' $995.00 came on. I told my housemate, "WHAT? THOSE THINGS are nearly $1,000.00????? I can go into Target & get a very decent facsimile for under $10.00!" Yeah, I KNOW! A diamond and a piece of glass are vastly different. But TO ME, they look the same! Almost 99% of the time I find those Prada and Coach items – BOTH the real deals and the knockoffs – to look UGLY! I'll take a new home, furnishings, a wardrobe, and some change in the bank with what those Prada things cost. And IF I have anything left, I'll go buy myself some Target earrings. Now, aren't you sorry you have such an opinionated friend? LOL! Hmmm, what a debatable subject. Knockoffs versus originals. Well as someone who has both, I’ll share my take on it. I use to buy the knockoffs for two reasons. The first being, I couldn’t afford the original, the second it was meant as a “Hey look at me, I am hip and fashionable!” Yet when I walked around with the knockoff, I felt more like a fraud, then a fashionista. Now I buy the “real” Coach purses. Why you ask? Because I like them and more importantly, because I can! Now it has less to do with fashion and more to do with a “look what I have accomplished, to myself”. Over the years I have worked hard to get where I am today. I’m overly generous to others, it’s time I be to myself. My real purses are a way I spoil myself, besides they truly last longer than the fakes I bought in the past. So yes, I can buy a knockoff and no one would probably be any wiser, but the one person who would know, the only person I need to impress (me) would. I’m not doing it for others, I’m doing it for me! I would much rather have one original good purse than 5 or 6 knockoffs. The original leather Coach leather purses last for years (I still have two of my old ones) and the new cloth styles are made from some tough material. Plus the hardware is much better on an original than a knockoff. I will save my pennies and buy an original at TJ Maxx at a discount and do without a purse until I can buy one as opposed to buying a knockoff. I can do without other frivilous items so I can purchase a good purse. I’m another that rewards myself with an investment bag. Classic originals will last and last and will remain classics! I love my Louis Vuitton Speedy 40 and paid a pretty penny for him, but I didn’t buy it so people would say “Oh wow! She has a Louis Vuitton.” I purchased it because, like LauraG said, I can…and I enjoy having a few quality accessories instead of knockoffs. Same with quality Coach leather bags…I love them! I just cringe when I see people carrying around fake Coach bags…otherwise known as Goach bags for the Gs all over them. I mean…what’s the point??? Trying to be someone you’re not? or look like you can afford it? I don’t get it…and I’ll admit my own MOTHER does this and it drives me crazy! Wow, this is interesting. I do have a Coach checkbook/wallet that I got for Christmas and I’ve had it for years and I still love it and it still looks great. But, as for purses, my mood changes like the wind, so I just buy what appeals to me at the moment and don’t really go for the whole “status” thing. Same thing with clothes and shoes….I look at the design…not the label….I look at how it fits…not the size. As for jewelry…I’m really irresponsible, so I too go for the Target “diamond” studs and those big fun “fake” rings. I work in a hospital/clinic and I get a kick out of it when patients ask me if I’m married to a doctor….nope. I think a great haircut is money more well spent if you want to “look the part”.